Happy (late) Halloween! 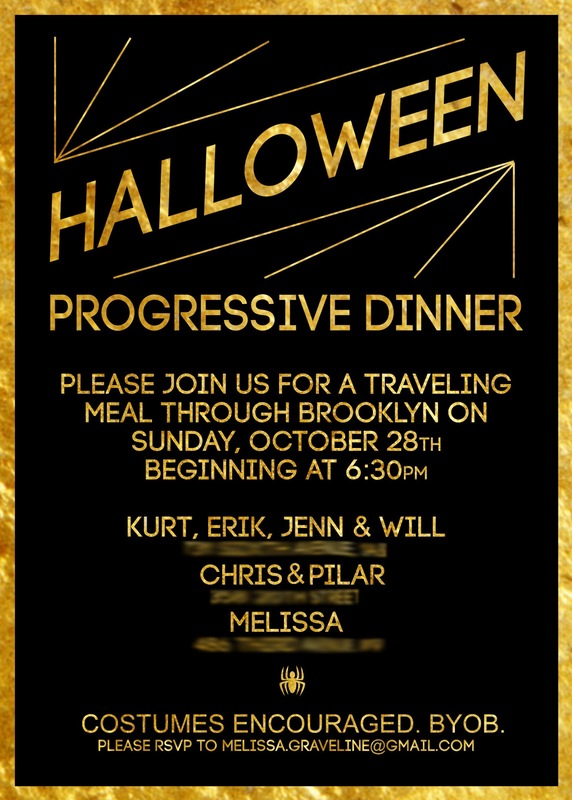 I wanted to throw a party for the occasion, so I organized a progressive dinner with some friends in Brooklyn (see last year's holiday party). Unfortunately, Hurricane Sandy tried to ruin our fun by bringing in high winds and subway cancellations A few people were deterred by the foul weather, but we had so many other die hard attendees! I was surprised with the turnout and everyone's awesome costumes. Sadly, we had to cut out my apartment from the progression because it is quite a walk from the others. We didn't want anyone to blow away! Here we are at Chris and Pilar's where they served some delicious banana themed dishes (alongside Chris' famous deviled eggs) to complement their costumes. I didn't get many pictures of the food but it was all delicious and we definitely pigged out. For my dessert portion of the dinner I went a little crazy with pumpkin. Inspired by this recipe, I combined Trader Joe's pumpkin butter and a little ricotta cheese and wrapped it in a Pillsbury Crescent Roll. Classy, right? I also had aspirations to make pumpkin whoopie pies but failed to make any of the cookies equal size for sandwiches. Whoops. They just ended up being cookies with icing. Still pretty good, if I say so myself. Cookie recipe found here. Icing recipe found here. Before "regressing" back to Kurt's apartment for dessert, we had a little runway show on Chris and Pilar's stairs so I could capture everyone's awesome costumes! Jenn as a hunter and her cousin Rachael (who ended up being stranded in Brooklyn with us for several days because of Sandy) as a super hero. Erik as a Fun-Guy and Silvia as a Fun-Gal (clarification). Christine as a cat. You need at least one at every Halloween party. John as Jim Cantore from the Weather Channel, very fitting for the blustery conditions. Victor as a Canadian Mountie. Will as an undecided voter. 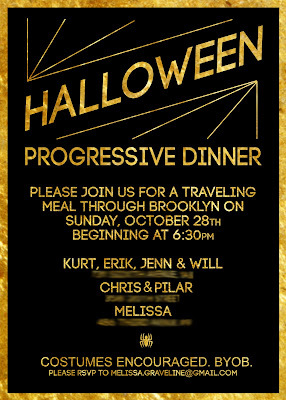 Kind of weak in the costume department, but he fried us delicious things all evening, so I will let it slide. Tim as a weather caster and Desiree as a storm cloud. Me as a s'more and Kurt as a Ballot Box. Chris as a (Bad) Banana and Pilar as the Chiquita lady. Thanks to everyone who braved the hurricane to celebrate with us!